Museum is a free theme crafted to showcase all of your best photographs, drawings, or illustrations. 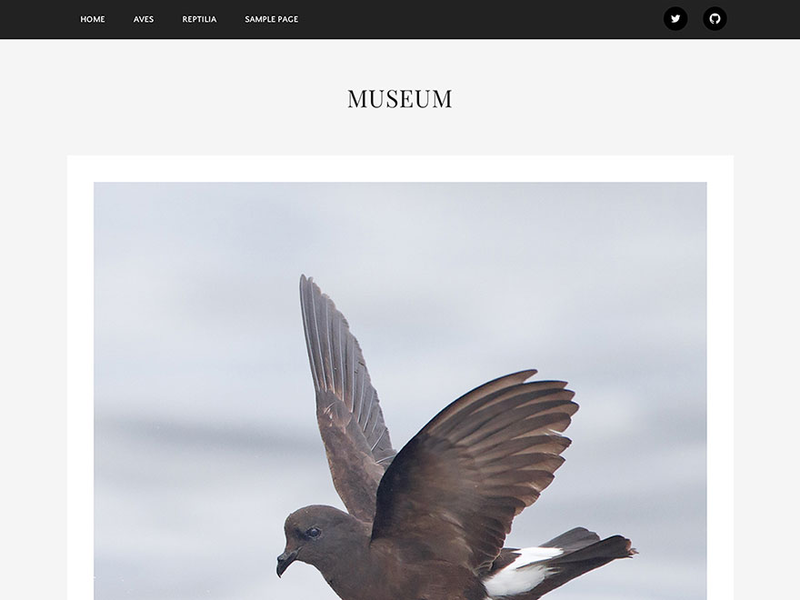 Featuring elegant, museum-inspired typography and ample room for your images, Museum pays special attention to category and media attachment pages to help your collections shine. 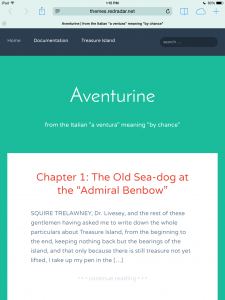 Create collections of image posts by adding them to the same category, and proudly show them off. Link to individual attachment pages with pride. Check it out for yourself. We’ve made it easy to add links to your social accounts. Just follow the handy instructions located on our documentation page. Museum is crafted to look great at any screen size. Supercharge Museum with Jetpack galleries, carousels, infinite scroll, and Photon. You can also check out Museum on Github if you’d like the LESS source files. I adore this theme but is there any way to disable the square crop on post pages? I’m ok with it on the main page but on post pages it can ruin an image, especially panoramic images. Glad you like it! We’ve fixed the issue in github and will be pushing it out with our next theme update. That’s awesome news! Looking forward to seeing how it looks after the update. Is there a way to disable to the top padding where the site title goes? I want the post area to be much closer to the navigation bar. Please help! Just add that to either your child theme, if you’re using one, or a CSS plugin like the one baked into Jetpack. Hello. I have to say I love the Museum theme. Thank you for creating it. I am not sure if this is the same as the question above – I would like to reduce the top margin on my pages. I am not sure what you mean by the child theme. Can you walk me through this? Or, you could use a plugin like https://wordpress.org/plugins/one-click-child-theme/ to create a child theme. Thank you. Do you happen to know why I don’t have a Plugin option on my WP Admin Dashboard? Hi, it looks like you’re actually on WordPress.com, not a self-hosted version of WordPress. WordPress.com does not allow you to make child themes or upload plugins. If you have a Premium Plan, you can use CSS to adjust the margin inside the Customizer. Hi! Which version of IE are you using? Can I change the order that the posts appear? 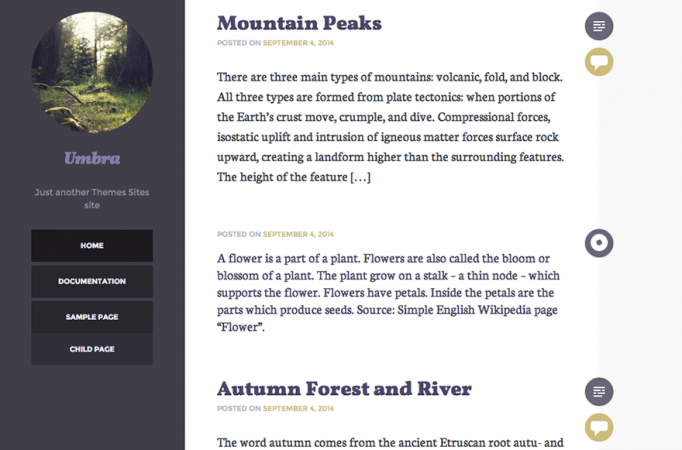 WordPress displays posts in reverse chronological order by default. There might be a plugin you could find that reverses this at https://wordpress.org/plugins/. You can move the timestamp, but you’d need to be comfortable creating a child theme and then duplicating and editing the template files. I’m narrowing down recommendations for a client and would like to include Museum. I don’t see a pro or paid version. Is there one? Just need to set expectations! I’m happy to edit at code level, but your samples show customization features that aren’t displaying for me. I set her up on Dreamhost/DreamPress, and am looking at the Colors options. All I see is a tool to change Header Text Color. No background colors, etc. Also surprised that photo aspect ratio is changed. I’m working here: harrietwien.com. Not sure how long I’ll leave things this way! Main photo is squished. I think you might be looking at the documentation for WordPress.com, which has additional color features. The .org version of Museum doesn’t come with any sort of tool to change the color scheme. 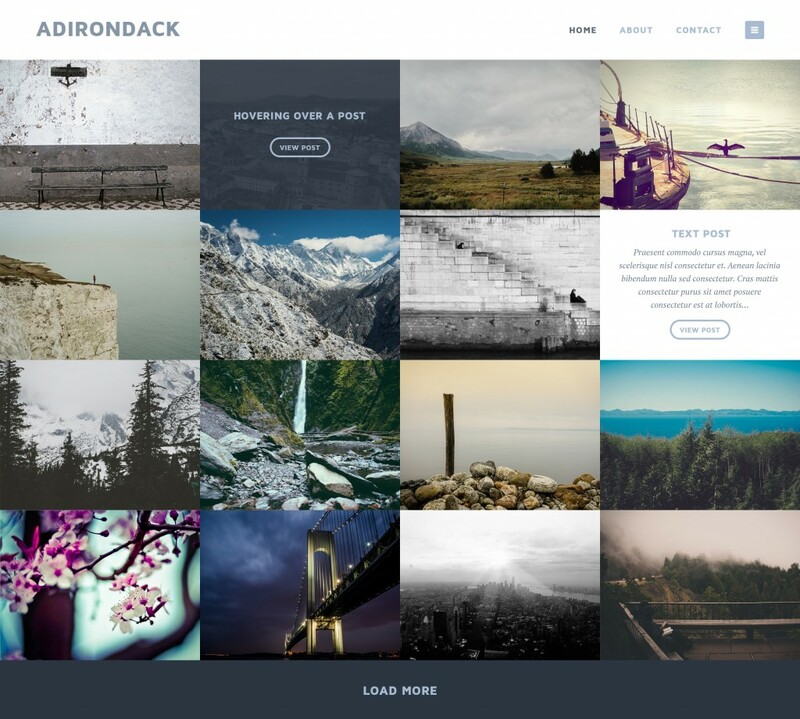 Unfortunately, there isn’t an easy way to adjust the aspect ratio, since the theme is meant to be displayed in an even grid with large photos. Mel, I really like this theme. I recently started using it, and like the way it handles my content. One hang up I can’t figure out… Is there a way to set the featured image to only show up as a thumbnail link to each post, but avoid having it displayed on the top of the post page? Thanks ahead of time for any help. Hi! When I’m using the theme on my iPhone, I see the following sentence “You may use these HTML tags and attributes: <abbr …….. etc. (it appears between the field Comment and the words Post comment / after each article). It is possible to delete it? Hi, GREAT theme, thanks for making it! 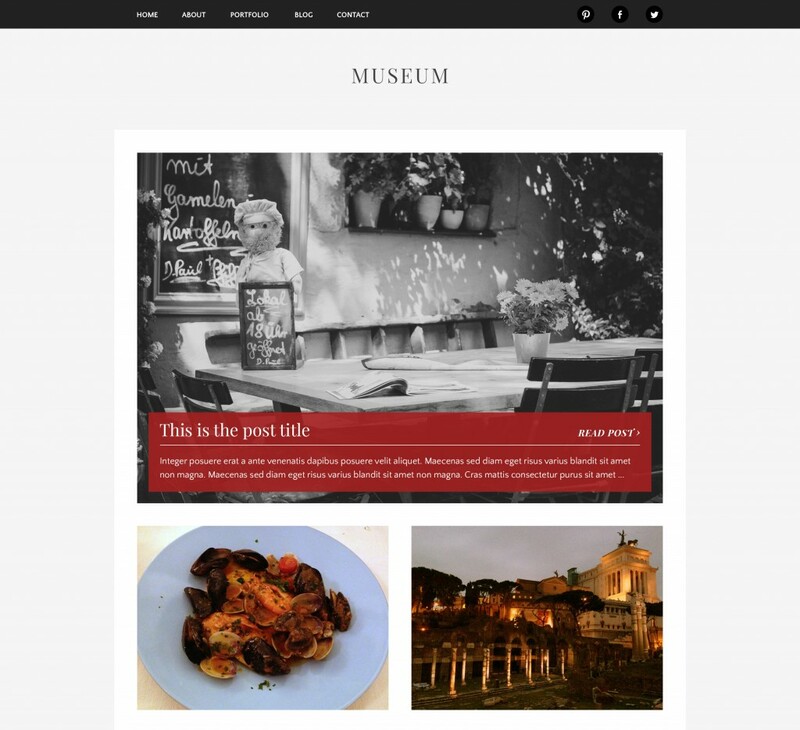 I’m trying to achieve two-column widgets in Footer Sidebar 2 as seen here: https://museumdemo.wordpress.com/ My widgets currently appear in a single column and I can’t seem to reposition them. My blog is hosted on wordpress.com and it looks like I’d have to pay to be able to do CSS overrides. Is the two column option not possible with the free wordpress.com set up? You should be able to do two columns on WordPress.com as well. Footer Sidebar 1 is the left column, and Footer Sidebar 2 is the right column — you’ll need to put a widget in each of them to make the columns. Hi, Im having some issues with the sizing of my photos. On the home page the photo is very large and rather blurry. when I Click into the blog post the feature image looks ok however my blog images are very small. Can you please tell me the best width and height to use so my images are clear? I’ve used Width 920 and Height 920 however my photo continues to be blurry and not very clear, cab you please advise how to fix this? Also what sizes are best to you use within the post? Are your photos still appearing blurry? I’m seeing them pretty sharp on your site now. Let me know if I can still help. Thank you much! Big help. 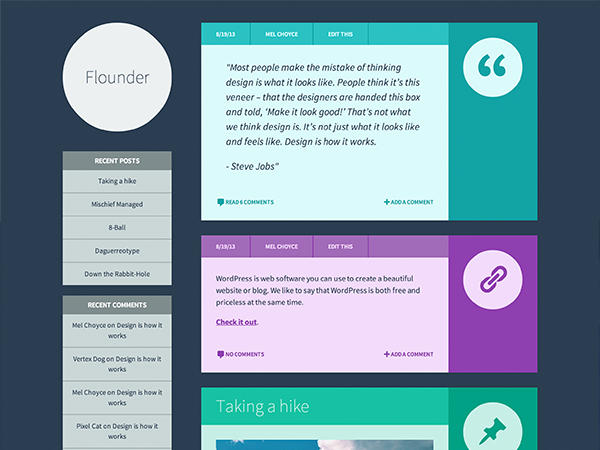 Proudly powered by WordPress | Theme: Highwind by James Koster.